Nice plugin,and I love it very much.I'am from China,I want to share this plugin to another Minecraft forum in China,called"mcbbs"(www.mcbbs.net/) .I wish you can accept,Thank you very much. when i ban a player, he will still join, how to fix this? When i change the Text in the "Messages" yml and try to Change the "Lockdown line" IT DOESNT MATTER i just changed 1 letter so see if it works... nope, why does ist not work? It seems you can no longer load YAML documents with InputStreams. Can you add option to see list of banned players (with page turning via command)? /history command can show only recent punishments, because earlier bans doesn't fit in chat. Your plugin is simply the best. I used AdvancedBan,but your plugin provides much better ip functionality. ALL : THE PERMISSION FOR THE COMMANDS ARE : maxbans.command. FOR EXAMPLE : maxbans.tempmute ! 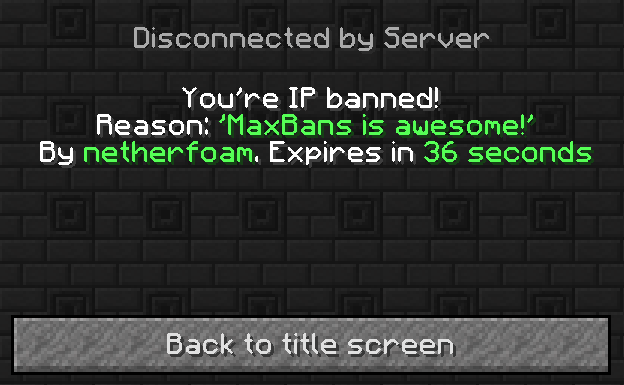 yeah i know but can i do : "maxbans.tempban.20" so the player can only ban someone for 20 days or less..
You can put the maximum tempban time in the config. Where is that in the config? # Sync is an advanced feature of MaxBans. # Or owners who want two servers to have the SAME banlist! # This option is in BETA! I take no responsibility if it breaks, though I will endeaver to fix it. default-reason: Not following the rules. appeal-message: Vist http://austinfrg.com/banappeal/ to Appeal. What are the perms to use mute and tempban and stuff can you add the perm to set the limet of how meny days a staff temp bans a player pls!